There she is, the ideal woman. You know you're going to pop the question sooner or later. Where, when, and how that magic moment occurs is up to you. We can help you with the how, especially if your decision involves a diamond. You see, a diamond not only says “Will you marry me?” It speaks volumes about how important that person is to you. Have you ever seen what an ideal cut diamond can do in sunlight? It's like having a fireworks display to enjoy over and over again. And every time she does, she’ll think of you. 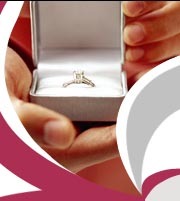 For over twenty two years, we have been providing ideal cut diamonds to our engagement couples at prices they can afford. We also provide uniquely designed jewelry for all the other special occasions in your life. So, if it's that magic moment or you've just heard the words “Honey. My present is ready”, we can help. We’re Diamonds and Design, located at Carlls Corner in Upper Deerfield and on Landis Ave. at Main road in Vineland. One Look ... See The Difference! The Vineland location is situated at the corner of Landis Ave. and Main Road in east Vineland. The phone number is 856-696-3600. The interior of the Vineland store is shown here. A comfortable relaxed atmosphere awaits our customers. The Carlls Corner location is located in Upper Deerfield on North Pearl Street. The phone number is 856-453-9523. The interior of the Carlls Corner Store is shown here. Marie, shown here with her microscope, has promoted Ideal cut diamonds since the inception of her business in 1986. She gives her customers the time they deserve in choosing the right diamond. For over twenty years, we have been providing breath-taking diamonds to our engagement couples at prices they can afford. As a member of the American Gem Society, whose motto is consumer protection since 1934, we understand that you the customer deserve to be treated with respect. We use the proper terminology for our gemstones and understand the differences between natural, synthetic and imitation stones. Our merchandise is fairly priced. Not marked up with the intention of offering a discount at will. We believed in full disclosure of all pertinent facts regarding the origin or enhancements of gemstones. So, if it's that magic moment, or you’ve just heard the words “Honey...My present is ready”. We can help.